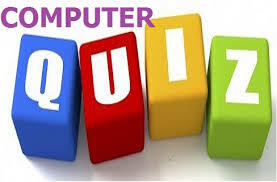 Dear Readers, we are presenting Computer Quiz for upcoming Bank Exams-SBI, IBPS. Computer section play important role in scoring. Q1. Instructions that are required to start a computer referred to as bootstrap. Where is the bootstrap loader located in the CPU? Q2. Which of the following is not one of the manufacturers of MOTHERBOARD? Q3. Which of the following is true regarding the characteristics of ports? (a) Can be a programmatic docking point from where a information flows. (c) Can also be used to connect external devices. Q4.Which of the following are type of ports? Q5. Which among the following are example(s) of application software? Q6. Convert (10101)2 into decimal system. Q8. ___________ Store data temporarily and pass it on as directed by the control unit. Q9. To access properties of an object, which technique should be used _______. Q10. __________ is a collection of web - pages and__________ is the very first page that we see on visiting a website. Sol. Microsoft is a headquartered in Redmond, Washington. MNC that develops, manufactures, licenses, supports and sells computer software, consumer electronics and personal computers and services. Sol. Ports are used to connect external devices or peripherals with computer. Soln. : There are various types of Ports for connecting several external hardware. Sol. Application software can be divided into two general classes: systems software and applications software. Applications software (also called end-user programs) include such things as database programs, word processors, Web browsers and spreadsheets. Sol. A (CPU register) is one of a small set of data holding places that are part of the computer processor. A register may hold an instruction, a storage address, or any kind of data. Some instructions specify registers as part of the instruction. Sol. Right clicking provides additional capabilities to a mouse. Sol. A website is a collection of related web pages, including multimedia content, typically identified with a common domain name, and published on at least one web server.